How did the United States justify imperialism? As production increased American business began to look out at the world as a means to support that growing industry. American businessmen and newspapers began to urge the American government to take actions that would lead to expansion and imperialism. Claiming Emerging business demanded it. As Americans increased business overseas it became necessary to protect those investments. In order to protect those investments America built the "great white fleet" that had been requested by Captain Alfred Thayer Mahan. (Last lesson) American policy was now going to based upon intervention and acquisition, not isolation and neutrality. Today we are raising more than we can consume. Today we are making more than we can use... Therefore we must find new markets for our produce, new occupation for our capital, new work for our labor... Ah! As our commerce spreads, the flag of liberty will circle the globe and the highway of the ocean - carrying trade to all mankind - will be guarded by the guns of the republic. And as their thunders salute the flag, benighted (ignorant) peoples will know that the voice of liberty is speaking, at last, for them... that civilization is dawning at last, for them. Our loved Egyptian (heathen) night? 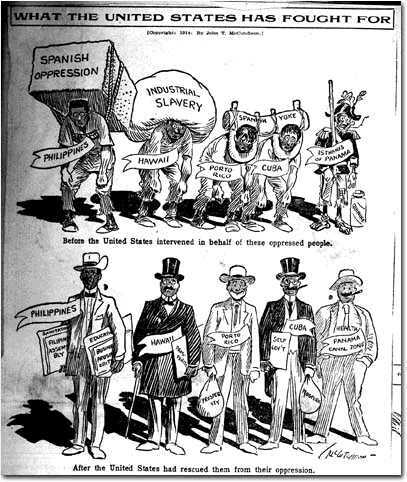 --Rudyard Kipling, "The White Man's Burden"
This cartoon entitled "What The United States Has Fought For" aptly describes the goals of missionaries and imperialists. Claiming it was God's Will. Many Americans felt it was not only our responsibility and duty but it was also a mandate by God. One of the leading proponents of imperialism was the Minister Josiah Strong. Minister Strong argued that America was in a race with other nations to dominate the world and acquire the limited resources the world had to offer. Strong claimed that America as the leading nation in the world (arguable at the time!) it was our destiny to acquire new lands. This idea sounds alot like Manifest Destiny because it is the same idea! In the following passage Strong makes his ideas quite clear. It seems to me that God, with infinite wisdom and skill, is training the Anglo-Saxon race for an hour sure to come in the worlds future. The lands of the earth are limited, and soon will be taken. Then will the world enter upon a new stage in its history- the final competition of the races. Then this race of unequaled energy, with the majesty of numbers and the might of wealth behind it- the representative of the largest liberty, the purest Christianity, the highest civilization... will spread itself over the earth. The reality is that even though we were expanding for economic reasons, we said it was for the reasons expressed above. American policy makers were clear in the course of action. We were to follow an aggressive imperialistic foreign policy.